I cycle again and get away with it a bit weather wise. There’s a bit of drizzle in both directions but it never comes to much. L is having a mid-life crisis. So she says. She reckons she needs a new ‘me’. Although I quite like the current one. I hope she isn’t planning on running off with someone in lycra with a ponytail. She says not, reassuring me that the male mid-life crisis is different to the female one and then tells me she’s put in for a part-time job at Waterstones. Yep, that's different. Where I’m sure she’d work for free as long as there’s a staff discount. L skives off the whole day; that is unless she’s moonlighting in Waterstones. 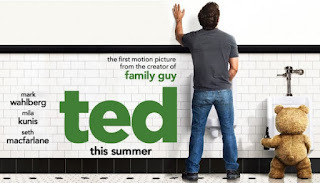 In fact she ends up at the cinema with Son, watching ‘Ted’, which is not a film that was on my radar but may have had its moments and Mila Kunis. A night out at the Wollaton pub with some friends tonight and then a night cap at the Wheelhouse where the ale is better.